"Indy 500" redirects here. For other uses, see Indy 500 (disambiguation). For the 2019 race, see 2019 Indianapolis 500. The inaugural race was held in 1911 and was won by Ray Harroun. The event celebrated its 100th anniversary in 2011, and the 100th running was held in 2016. Will Power is the current champion. The most successful drivers are A. J. Foyt, Al Unser Sr., and Rick Mears, each of whom have won the race four times. The active driver with the most victories is Hélio Castroneves, with three. Rick Mears holds the record for most career pole positions with six. The most successful car owner is Roger Penske, owner of Team Penske, which has 17 total wins and 17 poles. The Indianapolis 500 is held annually at the Indianapolis Motor Speedway, a 2.5-mile (4.0 km) oval circuit. Technically, the track is a unique rounded-rectangle, with four distinct turns of identical dimensions, connected by four straightaways (two long straightaways and two "short chutes"). Drivers race 200 laps, counter-clockwise around the circuit, for a distance of 500 miles (800 km). Since its inception in 1911, the race has always been scheduled on or around Memorial Day. Since 1974, the race has been specifically scheduled for the Sunday of Memorial Day weekend. The Sunday of Memorial Day weekend is widely considered one of the most important days on the motorsports calendar, as it is the day of the Indianapolis 500, Coca-Cola 600, and (currently) the Monaco Grand Prix. Practice and time trials are held in the two weeks leading up to the race, while other preliminary testing is held as early as April. Traditionally, the field consists of 33 starters, aligned in a starting grid of eleven rows of three cars apiece. The event is contested by "Indy cars", a formula of professional-level, single-seat, open cockpit, open-wheel, purpose-built race cars. As of 2018, all entrants utilize 2.2 L V6, twin-turbocharged engines, tuned to produce a range of 550–700 horsepower (410–520 kW). Chevrolet and Honda are the current engine manufacturers involved in the sport. Dallara is at present the sole chassis supplier to the series. Firestone, which has a deep history in the sport, dating back to the first 500, is currently the exclusive tire provider. The race is the most prestigious event of the IndyCar calendar, and one of the oldest and most important automobile races. It has been avouched to be the largest single-day sporting event in the entire world. Likewise, the Indianapolis Motor Speedway itself is regarded as the world's largest sporting facility in terms of capacity. The total purse exceeded $13 million in 2011, with over $2.5 million awarded to the winner, making it one of the richest cash prize funds in sports. Similar to NASCAR's Daytona 500, the Indianapolis 500 is typically held early in the IndyCar Series season. That is unique to most sports where major events are usually at the end of the respective season. Currently the Indy 500 is the sixth event of the 17-race IndyCar schedule. From the 1970s to the 1990s, Indianapolis was often the second or third race of the season, and as late as the 1950s, it was sometimes the first championship event of the year. Due to the high prestige of the Indianapolis 500—rivaling or even surpassing the season championship—it is not uncommon for some teams and drivers to concentrate heavily on preparation for the 500 during the early part of the season, and not focus fully on the championship battle until after Indy. Due to safety issues such as aquaplaning, the race is not held in wet conditions. In the event of a rain delay, the race will be postponed until rain showers cease, and the track is sufficiently dried. If rain falls during the race, officials can end the race and declare the results official if more than half of the scheduled distance (i.e., 101 laps) has been completed. The Indianapolis 500, as well as other IndyCar Series races, does not utilize the green–white–checker finish in case of a late race yellow. The race can, and in the past has, finished under caution. However, officials may call for a late race red flag to ensure a green flag finish, an option that was used in 2014. The Indianapolis Motor Speedway complex was built in 1909 as a gravel-and-tar track and hosted a smattering of small events, including ones for motorcycles. The first long-distance event, in "fearful conditions," was the 100-lap Prest-O-Lite Trophy in 1909, won by Bob Burman in a Buick. Breakup of the track surface led to two fatal accidents in the first two long-distance events (a 250 mi (400 km) and 300 mi (480 km), which was shortened to 235 mi (378 km) after two severe wrecks). That these spectacles had attracted 15,000 paying customers (and crowds of up to 40,000) persuaded principal owner Carl G. Fisher to spend US$155,000 on repaving the track with 3.2 million bricks; he also added a 2-foot-9-inch (0.84 m) concrete wall around the track's circumference. During the 1910 Decoration Day weekend, the first events on the newly paved circuit drew 60,000 spectators; Ray Harroun won the 200-mile (320 km) Wheeler-Schebler Trophy in a Marmon. The crowds grew progressively smaller for the rest of the season, however, so the track owners chose to focus on a single race. They considered a 24-hour contest, in the fashion of Le Mans, or a 1,000 mi (1,600 km). They instead chose a 500-mile (800 km) contest, as the estimated distance a race car could run before dark descended on the track, and a spectacular purse of $US25,000, equivalent to 82.93 lb (37.62 kg) of pure gold. The combination allowed the track to rapidly acquire a privileged status for automobile races. The first "500" was held at the Speedway on Decoration Day (as Memorial Day was known from its inception in 1868 to 1967 when Federal Law made Memorial Day the official name), May 30, 1911, run to a 600-cubic-inch (9,800 cc) maximum engine size formula. It saw a field of 40 starters, with Harroun piloting a Marmon Model 32-based Wasp racer—outfitted with his invention, the rear view mirror. Harroun (with relief from Cyrus Patschke) was declared the winner, although Ralph Mulford protested the official result. Eighty thousand spectators were in attendance, and an annual tradition had been established. Many considered Harroun to be a hazard during the race, as he was the only driver in the race driving without a riding mechanic, who checked the oil pressure and let the driver know when traffic was coming. In 1912, the purse was raised to US$50,000. The field was limited to 33 (where it remains) and a riding mechanic was made mandatory. This second event was won by Joe Dawson in a National, after Ralph de Palma's Mercedes broke. Although the first race was won by an American driver at the wheel of an American car, European makers such as the Italian Fiat or French Peugeot companies soon developed their own vehicles to try to win the event, which they did from 1912 to 1919. The 1913 event saw a change to a 450-cubic-inch (7,400 cc) maximum engine size. After World War I, the native drivers and manufacturers regained their dominance of the race. Engineer Harry Miller set himself up as the most competitive of the post-war builders. His technical developments allowed him to be indirectly connected to a history of success that would last into the mid-1970s. For musical entertainment prior to the start of the race, the Purdue All-American Marching Band has been the host band of the race since 1919. In 1946, American operatic tenor and car enthusiast James Melton started the tradition of singing "Back Home Again in Indiana" with the Purdue Band before the race when asked to do so on the spur of the moment by Speedway president Tony Hulman. This tradition has continued through the years, notably by actor and singer Jim Nabors from 1972 until 2014. Nabors announced in 2014, citing health-related reasons, that the 2014 Indy 500 would be the last at which he would sing the song. In 2015, the a cappella group Straight No Chaser sang the song before the race, and since Nabors' retirement (and before he became the regular singer), the singing of the song is done on a rotating basis. However, the Speedway has returned to a standard singer starting in 2017, with Jim Cornelison doing it for two races as of the 2018 race. Following the European trends, engine sizes were limited to 183 cu in (3,000 cc) during 1920–1922, 122 cu in (2,000 cc) for 1923–1925, and 91 cu in (1,490 cc) in 1926–1929. The 1920 race was won by Gaston Chevrolet in a Frontenac, prepared by his brothers, powered by the first eight-cylinder engine to win the 500. For 1923, riding mechanics were no longer required. A supercharged car, ID, first won the race in 1924. In 1925, Pete DePaolo was the first to win at an average over 100 mph (160 km/h), with a speed of 101.13 mph (162.75 km/h). In the early 1920s, Miller built his own 3.0-liter (183 in3) engine, inspired by the Peugeot Grand Prix engine which had been serviced in his shop by Fred Offenhauser in 1914, installing it in Jimmy Murphy's Duesenberg and allowing him to win the 1922 edition of the race. Miller then created his own automobiles, which shared the 'Miller' designation, which, in turn, were powered by supercharged versions of his 2.0- and 1.5-liter (122 and 91 in3) engine single-seaters, winning four more races for the engine up to 1929 (two of them, 1926 and 1928, in Miller chassis). The engines powered another seven winners until 1938 (two of them, 1930 and 1932, in Miller chassis), then ran at first with stock-type motors before later being adjusted to the international 3.0-liter formula. After purchasing the Speedway in 1927, Eddie Rickenbacker prohibited supercharging and increased the displacement limit to 366 cu in (6,000 cc), while also re-introducing the riding mechanic. Meanwhile, European manufacturers, gone from the Indianapolis 500 for nearly two decades, made a brief return just before World War II, with the competitive Maserati 8CTF allowing Wilbur Shaw to become the first driver to win consecutively at Indianapolis, in 1939 and 1940. With the 500 having been a part of the Formula One World Drivers' Championship between 1950 and 1960, Ferrari made a discreet appearance at the 1952 event with Alberto Ascari, but European entries were few and far between during those days. Among the Formula One drivers who did drive at the speedway was five-time world champion, Argentinian Juan Manuel Fangio, though he failed to qualify for the 1958 race. In fact, it was not until the Indianapolis 500 was removed from the Formula One calendar that European entries made their return. In 1963, technical innovator Colin Chapman brought his Team Lotus to Indianapolis for the first time, attracted by the large monetary prizes, far bigger than the usual at a European event. Racing a mid-engined car, Scotsman Jim Clark was second in his first attempt in 1963, dominating in 1964 until suffering suspension failure on lap 47, and completely dominating the race in 1965, a victory which also interrupted the success of the Offy, and giving the 4.2-liter Ford V8 its first success at the race. The following year, 1966, saw another British win, this time Graham Hill in a Lola-Ford. The Offenhauser engine was also paired with a European maker, McLaren, obtaining three wins for the chassis, one with the Penske team in 1972 with driver Mark Donohue, and two for the McLaren works team in 1974 and 1976 with Johnny Rutherford. This was also the last time the Offy would win a race, its competitiveness steadily decreasing until its final appearance in 1983. American drivers continued to fill the majority of entries at the Brickyard in the following years, but European technology had taken over. Starting in 1978, most chassis and engines were European, with the only American-based chassis to win during the CART era being the Wildcat and Galmer (which was actually built in Bicester, England) in 1982 and 1992, respectively. Ford and Chevrolet engines were built in the UK by Cosworth and Ilmor, respectively. Fernando Alonso was the most recent active Formula One driver to race at the Indy 500-mile race, in 2017. Prior to that, no active F1 driver had competed in the Indy 500 since 1984. After foreign cars became the norm, foreign drivers began competing in the Indianapolis 500 on a regular basis, choosing the United States as their primary base for their motor racing activities. Brazilian Emerson Fittipaldi, Italian Teo Fabi, and Colombian Roberto Guerrero, were able to obtain good outings in the 1980s, as was Dutchman Arie Luyendyk. However, it was not until 1993 that reigning Formula One World Champion Nigel Mansell shocked the racing world by moving to the United States, winning the CART PPG IndyCar World Series Championship and only losing the 500 in his rookie year because of inexperience with green-flag restarts. Foreign-born drivers became a regular fixture of Indianapolis in the years to follow. Despite the increase in foreign drivers commonly being associated with the CART era, it should be noted that four of the first six Indianapolis 500 winners were non-American drivers. For the 1981 race, the name "65th Indianapolis 500-Mile Race" was officially adopted, with all references as the "International Sweepstakes" dropped. Since 1981, the race has been formally advertised in this fashion, complete with a unique annual logo with the ordinal almost always included. Around that same time, in the wake of the 1979 entry controversy, and the formation of CART, the race changed to an invitational event, rather than an Open, rendering the "sweepstakes" description inappropriate. For nearly a century, the race eschewed any sort of naming rights or title sponsor, a move, though uncommon in the modern sports world, that was well received by fans. This tradition finally ended in 2016 when a presenting sponsor, PennGrade, was added for the first time. In the 21st century, the facility has also slowly added sponsorship ads on the retaining walls and infield grass. The ESPN-produced ABC telecast of the event did not recognize this sponsorship, and instead had Firestone Tires as its presenting sponsorship. The Borg-Warner Trophy, introduced in 1936, proclaims the event as the "Indianapolis 500-Mile Race", with no reference at all to the name "International Sweepstakes". In 2009, the Indianapolis Motor Speedway began a three-year-long "Centennial Era" to celebrate the 100th anniversary of the opening of the track (1909), and the 100th anniversary of the first Indy 500 (1911). As a gesture to the nostalgic Centennial Era celebration (2009–2011), tickets for the 2009 race donned the moniker "93rd 500 Mile International Sweepstakes". It is the first time since 1980 that the "Sweepstakes" title has been used. During the month of May 2009, the ordinal (93rd) was used very sparingly, and for the first time since 1981, was not identified on the annual logo. Instead, in most instances in print, television, and radio, the race was referred to as the "2009 Indianapolis 500". Since the race was not held during the United States' participation in the two World Wars (1917–1918, 1942–1945), the advertised Centennial Era occurred during the 93rd to 95th runnings. To avoid confusion between the 100th anniversary, and the actual number of times the race has been run, references to the ordinal during the Centennial Era were curtailed. Female participation of any sort at Indianapolis was discouraged and essentially banned throughout the first several decades of competition. As such, female reporters were not even allowed in the pit area until 1971. There have been nine female drivers to qualify, starting with Janet Guthrie in 1977. Sarah Fisher has competed nine times, the most of any woman. Danica Patrick led 19 laps in the 2005 race and ten laps in the 2011 race, the only times a woman has led laps during the race. Pippa Mann has raced in Indy five consecutive times between 2013 and 2017. The Borg-Warner Trophy, presented to the Indy 500 winners in victory lane, and kept the rest of the year on permanent display at the Hall of Fame Museum. From 1911 to 1955, the race was organized under the auspices of the AAA Contest Board. 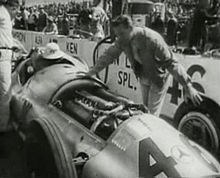 Following the 1955 Le Mans disaster, AAA dissolved the Contest Board to concentrate on its membership program aimed at the general motoring public. Speedway owner Tony Hulman founded USAC in 1956, which took over sanctioning of the race and the sport of Championship racing. From 1950 to 1960, the Indianapolis 500 also counted toward the FIA's World Championship of Drivers (now synonymous with Formula One), although few drivers participated in the other races of that series. Italian driver Alberto Ascari was the only European-based driver to actually race in the 500 during its World Championship years. His appearance in 1952 in a Ferrari was also the only time a Ferrari has ever appeared in the race. Juan Manuel Fangio practiced at the track in 1958 but declined an offer to race. Control issues of monetary prizes and squabbles over technical regulations caused conflict in the 1970s. Soon after the death of Tony Hulman in 1977, and the loss of several key USAC officials in a 1978 plane crash, several key team owners banded together and formed CART in late 1978 to sanction the sport of Indy car racing. The Indianapolis 500 itself, however, remained under the sanctioning control of USAC. It became the lone top-level race the body still sanctioned, as it ultimately dropped all other Indy car races (as well as their stock car division) to concentrate on sprints and midgets. For the next three years, the race was not officially recognized on the CART calendar, but the CART teams and drivers comprised the field. By 1983, an agreement was made for the USAC-sanctioned Indy 500 to be recognized on the CART calendar, and the race awarded points towards the CART championship. In 1994, Speedway owner Tony George announced plans for a new series, to be called the Indy Racing League. The Indy 500 would serve as its centerpiece. Opinions varied on his motivations, with his supporters sharing his disapproval of the race's lack of status within CART, the increasing number of foreign drivers (as American drivers were gravitating towards NASCAR), and the decreasing number of ovals in the season series. Detractors accused George of throwing his weight around and using the race as leverage to gain complete control of the sport of open wheel racing in the United States. In 1995, and in response to a change in schedule by the CART series that put several races in direct conflict with Indy Racing League events, George announced that 25 of the 33 starting positions at the 1996 Indy 500 would be reserved for the top 25 cars in IRL points standings (similar in practice to NASCAR's Top 35 rule introduced years later). The move effectively left only eight starting positions open to the CART-regulars that chose not to participate in the IRL races. CART's reaction was to refuse to compromise on the schedule conflicts, skip the IRL races required to accumulate the qualifying points, boycott the race, and stage a competing event, the U.S. 500, on the same day at Michigan. Veteran Buddy Lazier won a competitive but crash-filled 1996 Indy 500. Two CART teams, Walker Racing and Galles Racing, competed in the Indianapolis 500 to fulfill sponsor obligations and were welcomed without incident. The U.S. 500, meanwhile, failed to garner as much interest and was marred by a huge crash on the pace laps that forced ten teams to use backup cars. CART would run at Gateway International Raceway a 300-mile race in ensuing years (1997–1999) instead. In 2000, Target Chip Ganassi Racing, still a CART-mainstay, made the decision to cross lines and compete at Indianapolis with drivers Jimmy Vasser and Juan Pablo Montoya. On race day, Montoya dominated the event, leading 167 of the 200 laps to victory. In 2001, Penske Racing returned and won the race with driver Hélio Castroneves. Penske and Castroneves repeated with a win in 2002. By 2003, Ganassi, Penske and Andretti Green all defected to the IRL permanently. CART went bankrupt later in the year, and its rights and infrastructure were purchased by remaining car owners, and it became the Champ Car World Series. The two series continued to operate separately through 2007. In early 2008, the two series were unified to create a single open wheel championship after a 12-year split being run under Indy Racing League/IMS control—known as the IndyCar Series. The 2012 race was the return of Turbocharged engines for the first time since 1996 with the use of the Dallara DW12 chassis and 2.2 L V-6 single turbo and twin turbocharged engines. In the 1960s and early 1970s, the Indy 500 and the World 600 (now known as the Coca-Cola 600) at Charlotte Motor Speedway were held on different days of the week. A handful of NASCAR regulars participated in both events in the same year, including Bobby Allison, Donnie Allison, Cale Yarborough, and Lee Roy Yarbrough. From 1974 to 1992, the two events were scheduled for the same day and same starting time, making participation in both impossible. A few stock car drivers during that time, namely Neil Bonnett in 1979, nevertheless still attempted to qualify at Indy, even if that meant skipping Charlotte altogether. From 1994 to 2014, several NASCAR drivers were able to compete in both the Indy 500 and the Coca-Cola 600 at Charlotte in the same day. Since 1993, the Coca-Cola 600 has been scheduled in the evening the same day as the Indy 500. The effort has been known as "Double Duty". At the conclusion of the Indy 500, drivers would catch a helicopter directly from the Speedway to the Indianapolis International Airport. From there they would fly to Concord Regional Airport, and ride a helicopter to the NASCAR race. John Andretti, Tony Stewart, and Robby Gordon attempted the feat, with Kurt Busch being the latest in 2014. In 2001, Tony Stewart became the first driver to complete the full race distance (1,100 miles) in both races on the same day. Two drivers, Mario Andretti and A. J. Foyt, have won the Indianapolis 500 and the Daytona 500. Foyt also won the 24 Hours of Daytona and 12 Hours of Sebring, America's premier endurance races, as well as the 24 Hours of Le Mans. Foyt won Le Mans in 1967, about one month after winning his third Indy 500. Andretti won the 1978 Formula One World Championship and is a three-time Sebring winner (he also won the 6-hour version of Daytona). Indianapolis 500 winner Johnny Rutherford once won one of the Daytona 500 qualifying races. In 2010, Chip Ganassi became the first car owner to win the Daytona and Indianapolis 500s in the same year, with Jamie McMurray winning the Daytona 500 and Dario Franchitti winning the Indianapolis 500. In 2010, Bruton Smith (owner of Speedway Motorsports, Inc.), offered $20 million to any driver, IndyCar or NASCAR, who can win both the Indianapolis 500 and the Coca-Cola 600 on the same day starting in 2011, a feat that had never been accomplished. For 2011, the Indianapolis Motor Speedway moved the start time of the Indy 500 back to 12:15 PM EDT (prior to 2005, the engines started at 10:52 AM EST; under the modern schedule, engines start around 12:05 PM for a start around 12:15 PM), which re-opened the window for travel. Brad Keselowski suggested that he would consider answering the challenge in 2014. It was announced on March 4, 2014, that Kurt Busch would attempt to qualify for the 2014 Indianapolis 500, driving a fifth car for the Andretti Autosport team. Busch completed all 500 miles at Indy to finish sixth but dropped out of the 600 with a blown engine just past the 400-mile mark. Technical specifications for the Indianapolis 500 are currently written by IndyCar. Rules are generally the same as every other IndyCar race. In the past, particularly during the era in which USAC sanctioned the Indy 500 (but CART sanctioned the other Indy car races), rules at Indy slightly differed at times. The result, for example, would be a particular chassis or engine configuration being legal at Indy, but not so at the CART-sanctioned events. This was rather commonplace in the 1980s and early 1990s, when "stock-block" engines (namely the V-6 Buick) was allotted an increased level of turbocharger boost by USAC at Indy, compared to the purpose-built V-8 quad-cam engines. While the "stock block" engines were technically legal in CART competition, they were not given the increased boost advantage, which effectively rendered them uncompetitive, and precluded their use by teams. The most famous manifestation of the USAC rules disparity was the Ilmor-built Mercedes-Benz 500I engine fielded by Roger Penske in 1994. Scott Dixon makes his pole-winning qualification run for the 2008 Indianapolis 500. The longest-running Indy racing memorabilia show is the National Auto Racing Memorabilia Show. 2011 Indianapolis 500 winner Dan Wheldon holding a bottle of milk. Louis Meyer requested a glass of buttermilk after winning his second Indy 500 race in 1933. After winning his third title in 1936, he requested another glass but instead received a bottle. He was captured by a photographer in the act of swigging from the bottle while holding up three fingers to signify the third win. A local dairy company executive recognized the marketing opportunity in the image and, being unaware Meyer was drinking buttermilk, offered a bottle of milk to the winners of future races. Milk has been presented each year since then, apart from 1947 to 1955. Modern drivers are offered a choice of whole, 2%, and skim. At the 1993 Indianapolis 500, winner Emerson Fittipaldi, who owned and operated an orange grove, notoriously drank orange juice instead of milk during the televised winner's interview. He eventually relented and also drank from the milk bottle later in the post-race ceremonies after the broadcast was over, but the public relations damage had already been done. The snub led to Fittipaldi being booed at the next ChampCar race, the Milwaukee Mile, in Milwaukee, Wisconsin, the heart of dairy country, and by some, as late as the 2008 Indianapolis 500 in which he drove the pace car. In the 2016 Indianapolis 500, as a promotion, the track gave out commemorative bottles of milk to 100,000 attendees to toast the winner with milk after the race. Radio coverage of the race dates back to 1922. The race has been broadcast live on the radio in its entirety by the Indianapolis Motor Speedway Radio Network since 1953. The Hulmans did not allow live television coverage of the 500 until 1986, largely to maximize gate attendance. The race was briefly televised live in 1949 and 1950 on WFBM-TV (today's WRTV), after which the practice was discontinued. From 1964 to 1970, the race was broadcast live on closed-circuit television in theaters around the country. From 1965 through 1970, a highlighted version of the race was shown on ABC's Wide World of Sports. From 1971 through 1985, an edited same-day, tape delay broadcast of the race was shown in prime time. The race broadcast was edited down to either two or three hours in duration (including commercials). From 1986 through 2018, ABC televised the race live in its entirety. However, at the request of the Speedway, Indianapolis affiliate WRTV was required to blackout the live broadcast and carry it on tape delay in prime time to encourage local race attendance. In 2007 (the first year in which the race was carried under the ESPN on ABC branding), the race was first aired in high-definition. In 2016, the IMS declared a sell-out of race tickets for the 100th running of the event, meaning that WRTV would be allowed to air the race live for the first time since 1950. In 2019, the Indianapolis 500 will move to NBC, as part of a new three-year contract that unifies the IndyCar Series' television rights with NBC Sports (the parent division of IndyCar's current cable partner NBCSN), and replaces the package of five races broadcast by ABC with an eight-race package on NBC. The Indianapolis 500 will be one of eight races, which ended ABC's 54-year tenure as broadcaster of the race. WTHR will be the local broadcaster of the race under this contract; the existing blackout policy is expected to continue. ^ "World Stadiums - Stadium List :: 100 000+ Stadiums". Retrieved 1 May 2016. ^ Wilfred Bourque (Kettlewell, p.1013, mistakenly identifies him as William) and his riding mechanic were killed after hitting a pothole in the 250, and Charlie Merz's riding mechanic, Claude Kellum, as well as two spectators, were killed in the 300; following Merz's crash, there was another serious crash, also. Kettlewell, p.1013. ^ "Yard of Bricks". Indianapolis Motor Speedway. ^ Martin, J. A.; Saal, Thomas F. (2004-03-05). American Auto Racing: The Milestones and Personalities of a Century of Speed. McFarland. p. 24. ISBN 9780786412358. ^ a b "IMS Milestones: 1906–1911". Indianapolis Motor Speedway. Archived from the original on 2010-06-06. ^ "The Marmon Wasp". The Marmon Group. Archived from the original on 2010-06-16. ^ Leerhsen, Charles, "100 Years of the Indy 500", Sports Illustrated, 30 May 2011, pp. 52–56. ^ The company was owned by Speedway investor Arthur C. Newby. ^ a b "Miller History". The Miller/Offenhauser Historical Society. ^ "James Melton Autorama". Florida's Lost Tourist Attractions. ^ "Watch Straight No Chaser step into Jim Nabors' shoes, sing to kick off the Indy 500". Entertainment Weekly's EW.com. Retrieved 1 May 2016. ^ Coggan, Devan (24 May 2015). "Watch Straight No Chaser step into Jim Nabors' shoes, sing to kick off the Indy 500". EW.com. Retrieved 31 May 2017. ^ "1926 Miller 91 FWD". Supercars.net. ^ "All time Indianapolis 500 winners". USA Today. ^ "1950 Indianapolis 500". Formula One Administration. ^ "Indianapolis Motor Speedway (Speedway, Indiana, USA)". F1complete.com. Archived from the original on 2010-01-16. ^ "1952 Indianapolis 500". Formula One Administration. ^ "Jim Clark, the Scottish driver who became an American idol". The Scotsman. ^ "RACING HISTORY: The Great Races: 1965 Indianapolis 500". The Auto Channel. ^ "50th Indianapolis 500-Mile Race at the Indianapolis Motor Speedway Monday, May 30, 1966". Indianapolis Motor Speedway. Archived from the original on July 13, 2011. ^ "56th Indianapolis 500-Mile Race at the Indianapolis Motor Speedway Saturday, May 27, 1972". Indianapolis Motor Speedway. Archived from the original on July 13, 2011. ^ "58th Indianapolis 500-Mile Race at the Indianapolis Motor Speedway Sunday, May 26, 1974". Indianapolis Motor Speedway. Archived from the original on July 13, 2011. ^ "60th Indianapolis 500-Mile Race at the Indianapolis Motor Speedway Sunday, May 30, 1976". Indianapolis Motor Speedway. Archived from the original on July 13, 2011. ^ "76th Indianapolis 500-Mile Race at the Indianapolis Motor Speedway Sunday, May 24, 1992". Indianapolis Motor Speedway. Archived from the original on July 13, 2011. ^ "Nigel Mansell". Formula One Administration. ^ "Limit Auto Race Entries: Only Thirty-Three Drivers to Start in Indianapolis Sweepstakes". The New York Times. The New York Times Company. May 6, 1919. Retrieved 2015-05-28. ^ "ABC's 54th Indianapolis 500 Telecast Bringing Consecutive Streak to Close". ESPN MediaZone. Retrieved 2018-05-28. 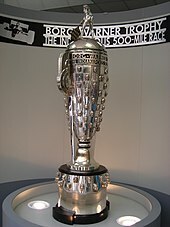 ^ "The Borg-Warner Trophy". IndySpeedway.com. Archived from the original on 2010-03-29. ^ "Indianapolis Motor Speedway Centennial Era, 2009–2011". Indiana Office of Tourism Development. Archived from the original on 2010-05-28. ^ "Page Not Found". Retrieved 1 May 2016. ^ "Indy 500: What you need to know". IndyStar. Retrieved 29 May 2016. ^ "USAC National Sprint Car Series". world-sprintcar-guide.com. ^ "Penske, Roger – Overview, Personal Life, Career Details, Social and Economic Impact, Chronology: Roger Penske". encyclopedia.jrank.org. ^ "The Hulman Family, Owners of the Indianapolis Motor Speedway since 1945". IndyStar.com. Archived from the original on 2012-07-10. ^ Ryan, Nate (April 17, 2008). "Indy car racing on track with new era, new issues". USA Today. Gannett Company. ^ "84th Indianapolis 500-Mile Race at the Indianapolis Motor Speedway Sunday, May 28, 2000". Indianapolis Motor Speedway. Archived from the original on July 13, 2011. ^ "85th Indianapolis 500-Mile Race at the Indianapolis Motor Speedway Sunday, May 27, 2001". Indianapolis Motor Speedway. Archived from the original on January 26, 2013. ^ "IRL, Champ Car entities sign merger deal". ESPN. ^ "Kurt Busch Won't Attempt Memorial Day Double". NASCAR.com. ^ "Winning Charlotte, Indy proving an impossible feat". NASCAR. ^ "Gunning for first NASCAR Sprint Cup win of the year in the Coca-Cola 600: Brad Keselowski's Autoweek blog". Autoweek. ^ "The Penske-Mercedes PC23-500I". forix.autosport.com. 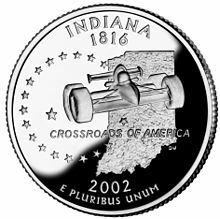 ^ "National Indy 500 Collector Club". Retrieved 1 May 2016. ^ IMS (March 16, 2016). "World's Largest Milk Toast Planned for 100th Running of the Indy 500". Indianapolis Motor Speedway. Retrieved May 31, 2016. ^ "91st Indianapolis 500 To Be Televised On ABC In Sony HD Technology". Indianapolis Motor Speedway. Archived from the original on 2015-05-22. ^ "Blackout lifted: RTV6 to show Indianapolis 500 LIVE on race day". TheIndyChannel.com. Scripps Media. 25 May 2016. Retrieved 25 August 2016. ^ "WRTV to air Indy 500 live". TVSpy. Retrieved 25 May 2016. ^ "The Indy 500 will soon have a new TV network". Indianapolis Star. Retrieved 2018-03-21. ^ Steinberg, Brian (2018-03-21). "NBC Sports Grabs Indianapolis 500 Rights From ABC After 54 Years". Variety. Retrieved 2018-03-21. ^ "How IndyCar-NBC deal will affect local Indy 500 blackout". Indianapolis Star. Retrieved 2018-03-21. Terry Reed. Indy: The Race and Ritual of the Indianapolis 500. 2nd ed. Potomac Books, Inc.; 2005. ISBN 978-1-57488-907-9. 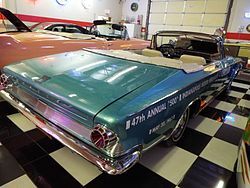 Wikimedia Commons has media related to Indianapolis 500.